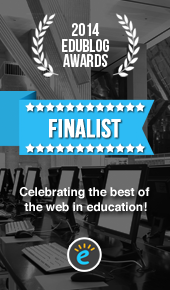 Cabra Library Blog Finalist in Edublog Awards Four Years Running! I have the great pleasure of announcing that the Cabra Senior Library Blog has once again been shortlisted as a finalist in the this year’s Edublog Awards. This is the fourth year running that we have made the shortlist, check out all the nominated finalists in each category here. To vote for us (please do) or to vote for any other blogs in the other categories just click on the badge above or visit the link here. Huge thanks goes out to all the students, teachers and everyone else who visited our blog again over the year and made comments or suggestions or just said hello. 2015 was our busiest year ever with over 12400 page hits, up almost 50% on last year! We are constantly expanding and improving this site and we will continue to use it as a central repository of the best educational technology and reading resources on the internet in 2014. Vote for us now! Just visit the link to the left, find Cabra Senior Library Blog in the list and click to record your vote. You only have till December 15th. You know you want to. Cabra Senior Library Blog Finalist in Edublog Awards For Third Year Running! Oh Boy! It gives me immense pleasure to announce that the Cabra Senior Library Blog has once again been shortlisted as a finalist in the 2014 Edublog Awards. This is the third year running that we have made the shortlist, check out all the nominated finalists in each category here. To vote for us (please do) or to vote for any other blogs in the other categories just click on the badge above or visit the link here. A massive thanks goes out to all the students, teachers and everyone else who visited our blog again over the year and made comments or suggestions or just said hello. We continue to increase our followers too as well as maintaining our visitor stats once again. We are constantly expanding and improving this site and we will continue to use it as a central repository of the best educational technology and reading resources on the internet in 2014. Vote for us now! Just visit the link to the left, find Cabra Senior Library Blog in the list and click on the thumbs up button. You will need to sign in or sign up to vote. You only have till December 15th. You know you want to. I am thrilled to announce that the Cabra Senior Library Blog has been shortlisted as a finalist in the 2013 Edublog Awards. This is the second year running that we have made the shortlist, check out all the nominated finalists in each category here. To vote for us (please do) or to vote for any other blogs in the other categories just click on the badge above or visit the link here. Thanks to all the many people who visited our blog again over the year and made comments or suggestions or just said hello. We are increasing our followers too as well as smashing last year’s visitor stats once again. We are constantly expanding and improving this site and we will continue to use it as a central repository of the best educational technology and reading resources on the internet in 2014. Vote for us now! You only have till December 20th. You know you want to. It is with great excitement that I can announce that the Cabra Senior Library Blog has been shortlisted as a finalist in the 2012 Edublog Awards. We are seriously thrilled to be nominated and now shortlisted for the 2012 Best Library/Librarian Blog. You can read all about the Edublog Awards here. To vote for us (please do) or to vote for any other blogs in the other categories just click on the badge above or visit the link here. Thanks to all the many people who visited our blog over the year and made comments or suggestions or just said hello. We are constantly expanding and improving this site and we will continue to use it as a central repository of the best educational technology and reading resources on the internet in 2013. Vote for us now! You know you want to. Nominations for the 2012 Edublogs Educational Blogging Awards have now opened. You have till Monday 26 November to nominate your favourite educational blogs in any or all of the following categories.